Much has been made about the lack of women in the tech industry and that women are in the minority when it comes to STEM courses. Salesforce – a multinational Customer Relationship Management (CRM) company – in partnership with Bridge21 aims to put more women in tech roles and STEM education through its CodePlus programme. As part of the Trinity Access 21 programme Codeplus is designed to help those who would not have the chance to access such education because of economic, educational or other disadvantages. In a meeting at Salesforce’s Irish Headquarters in Leopardstown this morning Minister for Education and Skills Richard Bruton was in attendance to promote the longstanding relationship between Salesforce and the Irish government as well as acknowledge the numerous advantages Bridge21 is giving to young women. The potential of Bridge21 is massive and with a donation of $100,000 by Salesforce it is set to continue providing opportunities to its participants through its workshops and speaking engagements. Bridge21 puts an emphasis on putting young women and girls in direct contact with women already working in STEM and technology fields. By giving them people already in these roles Bridge21 gives its participants people to look up to.”We’re trying to empower students to do things,” said Professor Brendan Tangey, the Academic Director of Bridge21. There is a two strand approach to this role model initiative. The first is a week long, intensive – around 20 hours – coding workshop for girls run by the funding company. The second is driven by speaking engagements given by women for women in all-girls secondary schools. Bridge21’s goal of making STEM accessible and demystifying the likes of computer science and computer engineering for girls is echoed by Salesforce. Salesforce is one of several leading Ireland-based tech companies – alongside the likes of Google and Facebook – and strives to create an equal working environment with a set of core values that it then applies to its philanthropic activities. It’s 1-1-1 model is a good example of this wherein the company provides one percent of its equity, one percent of its technology and one percent of its employee’s voluntary time throughout Salesforce’s global bases. “We have four values here: growth, innovation, trust and equality,” said Dr David Dempsey who is the Country Leader for Salesforce in Ireland. 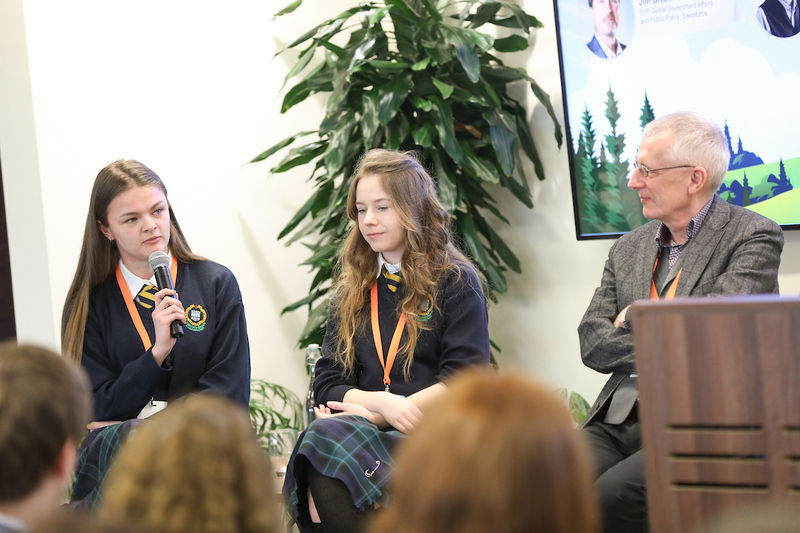 “Diversity is something we’re hugely passionate about here because if you look at this industry why would it not be accessible to all of society?” Salesforce’s goals reflect those of the Irish government’s investment plans for education. There is a genuine curiosity and interest around STEM as Klaudia explained. “I wanted to see what computer science is all about.” Aoife found that as well as coding the CodePlus workshop gave her other life skills. “I wouldn’t have been able to do public speaking if I hadn’t participated in Bridge 21,” she said after speaking publicly and ably on the subject at the meeting. Programmes like these not only teach participants how to code and use technology in new and exciting ways but also how to develop other skills along the way. “Bridge21 brings out the most of you as a person,” stated Aoife.